Keep your horses, beef and dairy cattle, livestock, pets and plants cool with mid-pressure and high-pressure mist systems and cool barn fans. Equine, Bovine, Poultry, & Swine….they all will thank you for our cool barn fans. Medical marijuana is helping thousands of people these days. Are you a cannabis grower or supplier? 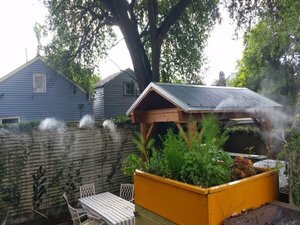 Learn how Mist Works products can help your Cannabis plants by clicking HERE. 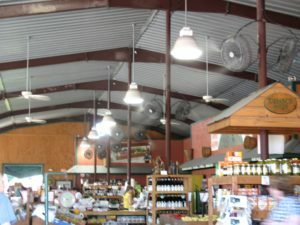 Mist systems for agriculture, nature and livestock can be for cooling, odor control, and/or humidity control. 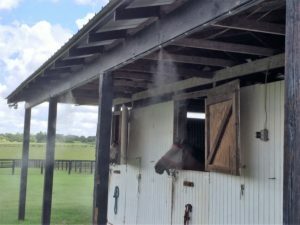 We can help keep your stables and barns cool and deter flies and flying pests with our commercial and industrial duty misting systems. The misting systems can have valves to shut off “zones” and leave others on, as well as run on timers. Fans have fully sealed motors for easy washdown, too! Drs. 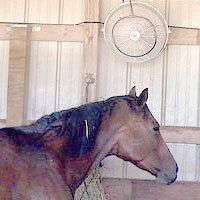 Foster and Smith website says a good way to “cool your horse while he rests in the barn with appropriate stable fans. 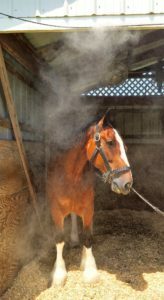 If possible, leave barn doors and windows open and install misting fans near each stall. Choose a run-in shed with an open-end design to promote airflow.” There is also a guide in the article on signs of heatstroke in horses! The “Reducing Heat Stress for Dairy Cattle”¹ study notes, “It has been found that milk yield peaked at 9 lb. more milk per day by cooled than non-cooled cows.” Maximum milk=maximum profit.